The Bear and the Nightingale is set in the 1300s in the northern forests of the Land of Rus’. Our main character, Vasilisa, or Vasya, is a gifted girl who must fight to save her father’s land from being destroyed by the evil spirit, Bear. Vasya struggles to find her place in a world where women have set tasks while her people attempt to find a balance between old and new beliefs. I have strong conflicting thoughts about The Bear and the Nightingale. The aspects I enjoyed had me finishing the book over a weekend, but the aspects I disliked have left me reluctant to recommend it. Let’s start with the things I liked. I adored the relationship between Dunya and Vasya. It was so kind, understanding, and nurturing. I found myself smiling while reading of Dunya doing her best to ‘tame’ the young Vasya, and failing miserably. I also loved the relationships between the siblings, especially between Vasya and Alyosha. The setting was fantastic. Arden’s prose had me immersed in the winter woods from the first word. I could smell the mead, feel the warmth of the fire, hear the faint crunch of snow underfoot, and embrace the struggle of the harvest. She kept me yearning for more information as each of the old world spirits emerged on the page. And Morozco…he was the main character that kept me reading. Just the complexity of his existence and the depth of his secrets are enough to carry the whole story. I wanted to know the details of his thoughts, his plans, his powers. After that you’re probably wondering why I didn’t love The Bear and the Nightingale. Well, Iwould have preferred the book to be a standalone instead of the first in the series, which would have allowed for more questions to be answered by the end. I will note the pacing was very well done for a debut novel, though there were moments, such as the final battle, where I longed for more detail. And Arden is definitely able to provide unique and detailed characters. But still, I couldn’t commit to loving this story. There are two reasons for this. First, I did not like how Christianity was handled. I liked how the village people mixed their old beliefs with their new religion. I understood the priest’s drive to rid the village of the old ways. However, I did not like how the religion was portrayed. At all. And this isn’t because I am a Christian. It was because the portrayal was only negative. All priests were political, power hungry people. Konstantin was a vain, cruel, selfcentered man who manipulated his ‘flock’ for personal entertainment. I know the religion was quite different in the 1300s but it only focuses on the need to fear God with not a single positive attribute of the faith shared. Honestly, the only time the church was painted in a remotely positive light was through Sasha’s eyes. I could make myself get past this if it wasn’t for the second point. Will I continue with the series? I want to say yes because I am intrigued by Morozco. 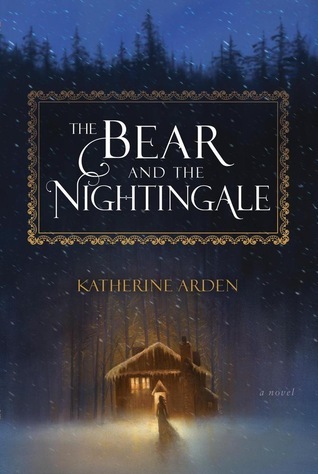 And because I enjoyed how hauntingly dark The Bear and the Nightingale is. Still, I don’t see myself clamoring to pick up the next book. I do however look forward to Arden’s development as a writer. I find her background in history and cultures interesting and I think her writing, and story telling, will just continue to improve as time passes.